Mobile messaging is becoming the fastest means of communication on this planet. Just think how long it takes between your phone chiming for an incoming text and your hand moving towards it. What if you help your clients connect with their customers via mobile messaging? Thanks to 98% open rate and 45% response rate on average, your clients will be able to get much faster responses from their customers. 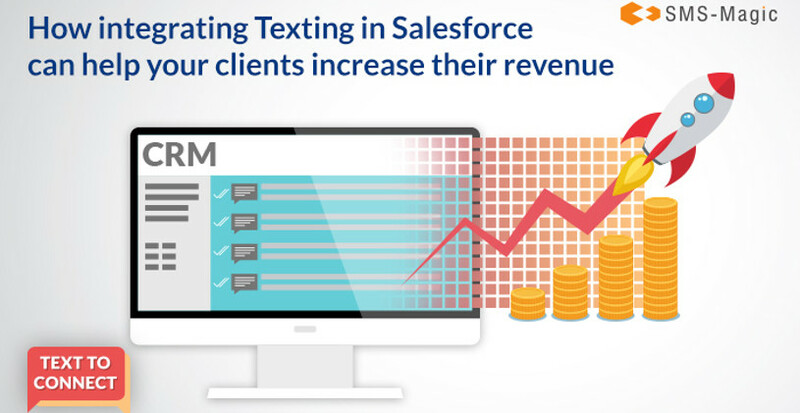 Using text messaging in Salesforce to drive revenues makes integrating text messaging with your CRM even more appealing. Research shows that 80% of sales require 5 follow-ups and 44% of the salespeople give up after the first follow-up. Regular follow-up channels like calling and email have discouraging response rates. Today’s customers are getting more and more attuned to receiving texts from businesses. In fact, 64% of them are likely to have a positive perception of a business that interacts via messaging. When you offer text messaging as a communication channel directly from Salesforce, your clients will get a much quicker response from their customers. Along with that, your clients will also be able to see all their customer conversations directly in their Salesforce Org. (SMS-Magic’s texting app for Salesforce offers this functionality via “Conversation View”). This conversational history for each contact will give them up-to-date and actionable insights into their sales pipeline. The sales team at Pluto was allocated hundreds of new leads daily. The team would generally do a background study of each prospect before calling. Since the team had to make so many calls, information about clients would get mixed up. Some leads had to be called multiple times, which would take hours. The salesperson also had to update the details of each call in the CRM. After integrating text messaging with Salesforce, each salesperson would start the day by sending a text message to all the leads assigned to him. Based on the text responses received, the salesperson has a priority list of hot leads ready within minutes. Since all the text responses were directly stored in Salesforce, the lead status could be automatically changed to hot. The salesperson could now easily prioritize and focus on closing the hot leads first. Managing the regular inflow of new leads daily and keeping the older leads engaged is a challenge that most sales reps face. With text messaging integrated with Salesforce CRM, the sales team at Pluto could now text and chat with multiple leads simultaneously. All that they had to do was open different tabs. Based on each lead’s information request, the rep could also share links from the ‘Resource Base’ saved within the CRM. One of the hardest things to do is to keep track of who said what to the prospects, what information they’ve seen, how they’ve responded to different topics etc. With integrated text messaging with Salesforce, the sales team could now have access to the complete conversational history. If a sales rep happened to be on leave, and someone else was assigned his leads, it became easy for the new rep to quickly scan the thread and place the lead in the sales cycle. Different teams like marketing could also quickly gauge the opportunity size of the current leads and decide on instant offers to accelerate time to sales. No shows at meetings are nightmarish for all sales reps. Apart from wasting time and energy, ‘no shows’ have an opportunity cost tied to them. Integrated texting helped the sales team at Pluto send sequential automated reminders before the meeting. By knowing the status of all the confirmed meetings in advance, the sales reps could optimize their time.The sales team at Pluto could see a definite merit in CRM text messaging. More and more customers are moving to text messaging as their primary form of conversation. Get a competitive advantage by offering texting functionality from your CRM. So what are you waiting for? If you have questions or would like to discuss how CRM integrated messaging can help your sales team, contact us or email at sales@sms-magic.com.